What is Inspire OST To PST Converter? Inspire OST TO PST Converter is a powerful OST to PST conversion tool designed to retrieve, repair, and convert damaged or corrupted Exchange OST files to PST format. The software can recover lost Outlook files and saves them to PST without any loss of information or change in folder structure and metadata. Inspire OST TO PST Converter can extract all file items including contacts, calendars, emails, appointments, and tasks and save them as PST files without installing MS Outlook. The software can detect OST errors and issues, quickly resolve them, and then converts OST files to PST. Inspire OST TO PST Converter allows users to work on single OST file and then split the converted PST file up to 5GB. Aside from OST to PST conversion, Inspire OST TO PST Converter enables users to export their OST files to other formats, including EML, MSG, MBOX, vCard, ICS and Microsoft Office 365. Inspire OST TO PST Converter is capable of recovering every data your PST files contain, even when they seem lost due to severe corruption and damage. Whatever information you have in your OST files, you can rest easy knowing every little detail can be extracted and/or restored to PST or other formats of your choice, including MSG, EML, EMLX, MBOX, vCal, vCard, and HTML file formats. Even the folder structure and metadata of your emails in OST are recovered and restored without any change. You just know that when you recovered your lost, corrupted, and damaged PST files to OST format, every little detail is there, including how the folders were organized. There is no integrity issue, allowing you to continue your tasks and get all the information you need so you can perform at the highest level. Some OST to PST Conversion software place limits on the sizes of OST files you can work with. The same can’t be said with Inspire Inspire OST TO PST Converter. You can recover data from OST files without worrying about size limits. Inspire OST TO PST Converter supports even the oldest Windows OS versions, which is great especially when you have tons of old files and history sitting in old computers that you want to move to your more modern PCs. The software works seamlessly with outdated Windows operating systems as early as Windows 97, providing you with a powerful conversion tool capable to moving tons of information decades ago to more secure, reliable, and easy to access modern formats. What Problems Will Inspire OST To PST Converter Solve? In the event when the OST document is corrupted and can’t be accessed, then make utilization of reliable Inspire Convert OST to PST to transform damaged Outlook OST to PST file. This device also converts encrypted or password blanketed OST file into PST file. You have to know that protection is unavoidable in software program structures. There’s no way to get admission to the mailbox information if the exchange server has gone for an everyday renovation. Once in a while, it can show up which you need to access the mailbox facts urgently. Although the reproduction of your mailbox records is stored in an ost record, you couldn’t synchronize the adjustments with the exchange server since it has long past for upkeep. Outlook records report is vulnerable to corruption, be it PST or OST. There are various motives for corruption in OST documents, which includes Mailbox records. It's essential to note that almost no app in the Collaboration Software category is going to be an ideal solution able to fulfill all the needs of different business types, sizes and industries. It may be a good idea to read a few Inspire OST To PST Converter reviews first as specific solutions may excel just in a very narrow set of applications or be prepared with a really specific type of industry in mind. Others can operate with an idea of being easy and intuitive and as a result lack complex functions desired by more experienced users. You can also find services that focus on a broad group of users and offer a complex feature base, however this usually comes at a more expensive price of such a software. Make sure you're aware of your needs so that you choose a service that has specifically the elements you search for. How Much Does Inspire OST To PST Converter Cost? Recover and Preview outlook items of the OST file. We realize that when you make a decision to buy Document Management Software it’s important not only to see how experts evaluate it in their reviews, but also to find out if the real people and companies that buy it are actually satisfied with the product. That’s why we’ve created our behavior-based Customer Satisfaction Algorithm™ that gathers customer reviews, comments and Inspire OST To PST Converter reviews across a wide range of social media sites. The data is then presented in an easy to digest form showing how many people had positive and negative experience with Inspire OST To PST Converter. With that information at hand you should be equipped to make an informed buying decision that you won’t regret. 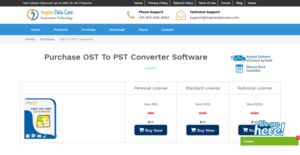 What are Inspire OST To PST Converter pricing details? What integrations are available for Inspire OST To PST Converter? If you need more information about Inspire OST To PST Converter or you simply have a question let us know what you need and we’ll forward your request directly to the vendor.